Explore the city by driving round the Civic District, passing by Padang, the Cricket Club, the historic Parliament House, the Supreme Court and City Hall. 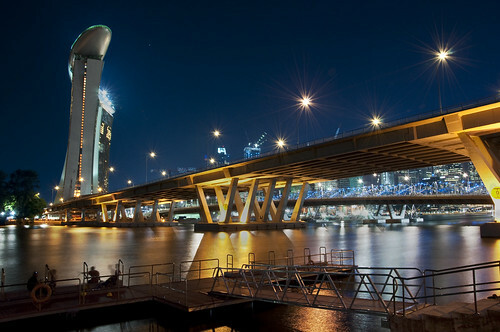 Next, stop at the Merlion Park and enjoy the impressive views of Marina Bay. Do not miss out on this great photo opportunity with the Merlion, a mythological creature that is part lion and part fish. Visit Thian Hock Keng Temple, one of Singapore's oldest Buddhist-Taoist temples, before driving past Chinatown. Stop by a local handicraft center and observe craftsmen at work up-close. Proceed to the National Orchid Garden, located within the Singapore Botanical Gardens, which boasts a sprawling display of 60,000 orchid plants. Our final stop at Little India will charm you with the scent of joss sticks, jasmine and spices. The opportunity to see a myriad of nocturnal animals in the secondary jungle full of mystery and drama will be yours. Look out for fierce predators and timid forest dwellers in their natural habitat under the subtle glow of the moon. You need not worry about safety because we will be traveling in a tram which takes us through the east and west loop passing by a large reservoir and weaving through selected habitats designed specifically to replicate the natural environment from the Himalayan Foothills to the Southeast Asian Rainforest and Indian Subcontinent. At the end of the tram ride, we will go on a walking trail where we can see some animals up close. See the place which was voted as the Singapore Tourism Board Leisure Attraction of the Year for three years. We will visit a peaceful and calm island just a short scenic cable car ride from Mount Faber. Upon reaching the island, we will see the Dolphin Lagoon where we can watch adorable pink dolphins performing tricks such as spy-hop, tail-flapping and vocalizations. A voyage to the bottom of the sea will be next on our agenda as we go to Underwater World, an 80-meter transparent acrylic tunnel which gives an opportunity to view over 2,500 sea creatures in close proximity. The next activity will be a journey to experience the colorful culture and vibrant heritage of Singapore re-told through life-size figures, animatronics and special effects at Images of Singapore. We will then head for the Musical Fountain after dinner and be enthralled by this state-of-the-art dramatic display of lasers and computer graphics, water jets and flames. We will dine by the River before taking in the beautiful sight of the central business district as we pass by the Benjamin Sheares Bridge. We will continue on to Bugis Street where our guide will take you for a stroll at the night market where you can get great bargains as you shop for souvenirs. We will end at Raffles Hotel to sample the optional Singapore Sling, Singapore's own mix of gin, cherry brandy and Benedictine.